This past weekend Mike and I did just that. We lathered on the sunblock and took a 10 minute bus ride to the seaside, renting a kayak for two and paddling around the shores of the city we live in for an hour. We got a completely different perspective of the city than we do every day. Like have you ever seen the back of the palazzo at the Westin resort, with its strange breakwaters? Or a parasail straight above your head? The distorted, grainy photo quality of these photos is thanks to our cheap little Coleman waterproof camera that I love because of its strange, quirky imperfections. But we're considering buying a GoPro to play around with. Do you have one? Do you like it? And tell me, what is there to do where you live that you haven't tried out yet? Hi Jess. Where did you rent the kayak from? 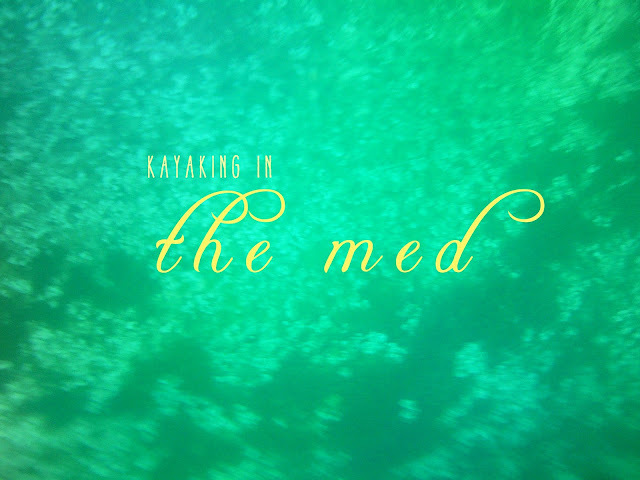 We are part of the kayak club where we live so regularly kayak, but have never done it in Malta. I love our go-pro. We use it for skiing. Also, in answer to your question about "stay-cations" we live in BC, we've travelled around the province a lot, there is so much variety and so much to discover, from landscapes to food to culture. But we also love Europe! Thanks for your comment! I think it was about €10 for an hour at the Corinthia Malta's water sports club in St. George's Bay (Paceville/St. Julian's area). I hope this helps!